Throughout its long history, Singapore has attracted people from different cultures, races and religions, who have settled on this thriving island, turning it into the confident, cosmopolitan society, which it is today. Singapore is home to Hindu, Buddhist and Chinese temples, Churches, Synagogues and Mosques, reflecting the diversity of the communities who live and worship here. 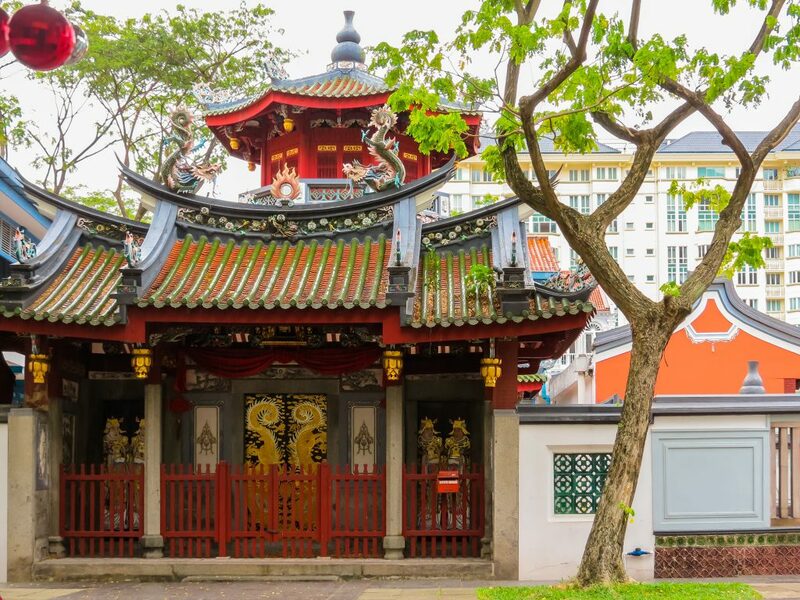 Situated on Telok Ayer Street, the Thian Hock Keng Temple or ‘Temple of Heavenly Happiness’ is Singapore’s oldest Chinese temple. The first Chinese immigrants would come to this temple to pray to the Goddess of the Sea, Mazu, to whom it is dedicated and thank her for bringing them safely across the South China Sea. The temple is open daily from 7.30am – 5.30pm and it is well worth visiting to admire its unique Fujian architecture style. It is said that it was constructed without using a single nail, and it is a magnificent building, decked in opulent gold, red and green, featuring intricately carved pillars and spectacular dragons. Age-old traditions such as ‘one year 10 cents for prayers to Tai Sui’ and Hokkien puppet shows still take place here, following the ancient customs. 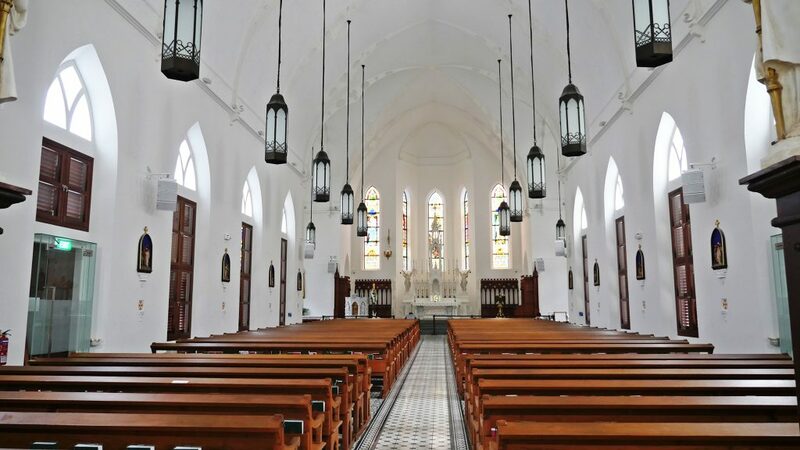 St. Andrew’s Cathedral is the largest cathedral in Singapore and also has the distinction of being its oldest Anglican church. It is built in the Early English Gothic style, following the design of a 13th century English church, with a nave with north and south aisles. It is worthwhile dropping in to the Visitors’ Centre to watch a video about the history of the Cathedral and admire pictures and artefacts relating to its past. The Chesed-El Synagogue, situated on Oxley Rise, was originally built in 1905 and is the newer of Singapore’s two synagogues. The Jewish community has contributed to Singapore’s development since the British colonial period and is still thriving today. Chesed-El Synagogue is built in the Palladian style, drawing on the influences of ancient Greco-Roman architecture, with imposing arches, impressive Corinthian style columns and a covered porch, which was originally designed to accommodate horse carriages. This contemporary mosque, which was opened in 2004 is sure to surprise you with its modern architecture. The architect deliberately broke with Islamic traditions, moving away from the domes, arches and minarets, used in the Middle Eastern model. The architect’s aim was, instead, to seek a fresh, modern, uniquely Singaporean identity for the building, by focusing on concepts such as ‘calm’, ‘spirituality’ and ‘a sense of oneness’, making full use of natural light. In 2008, the mosque, which is situated on Admiralty Lane, won the Chicago Athenaeum International Architecture Award.